Beinn Tulaichean and Cruach Ardrain are situated about 58 miles north of Glasgow, 18 miles north of Callander by Loch Doine and Loch Voil. It is 8 miles from the main road to the hiking car park along the single lane loch road with many passing places. The image below is of Balquhidder Church with the tallest grave stone being that of Rob Roy and his family. Balquhidder is a small village on the north side of Loch Voil. Glasgow to Loch Doine Map . The image below is of the Monachyle Mhor Hotel situated at the end of Loch Voil and the start of Loch Doine. The image below is of Beinn Tulaichean and the hiking car park at the end of Loch Doine. The public road ends at the car park so you have to walk from here. The style at the car park, as seen below, leads to Ben More, up to the right. The road straight ahead leads to Beinn Tulaichean and Cruach Ardrain. The image below is from a few hundred yards down an old road by the car park showing Cruach Ardrain out behind Beinn Tulaichean. The road to those two mountains goes along past the house over there and up into the mountains at Inverlochlarig Farm. 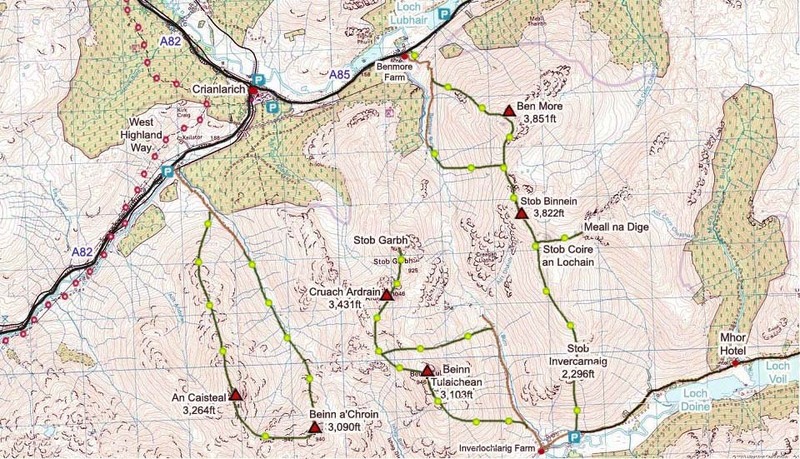 The Map below shows the route onto Cruach Ardrain and Beinn Tulaichean from the Loch Doine car park. Most hikers go over Beinn Tulaichean, on to Cruach Ardrain, then return down between the mountains onto the old farm road, although the route down between the mountains can be rough going in places. Stob Garbh is a sub peak of Cruach Ardrain. The image below is of the parking area at Loch Doine. The style here leads straight onto the the south side of the Ben More range. The road to the left leads to Beinn Tulachean and Cruach Ardrain. There are two mountains just south here that can also be hiked from this car park, the 2,851ft Stob a'Choin and the 2,257ft Stob Breac. The image below is looking back along Loch Doine and Loch Voil.